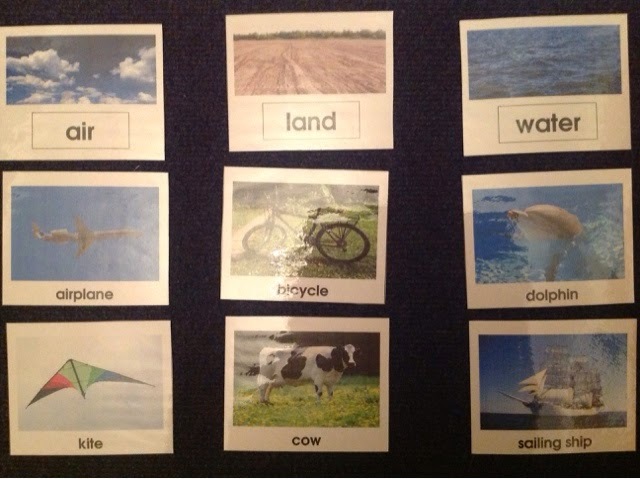 At the moment we have mostly sensorial and practical life activities out but we have a few language things too. Rogue developed a great interest in letters a month or so ago so I have been showing him a few sandpaper letters, we are taking it slow though. Here we have sensorial and practical life. On the floor in front is the pink tower on a little stand I made. (I say made...it's a box upside down with a square of pink paper stuck on). 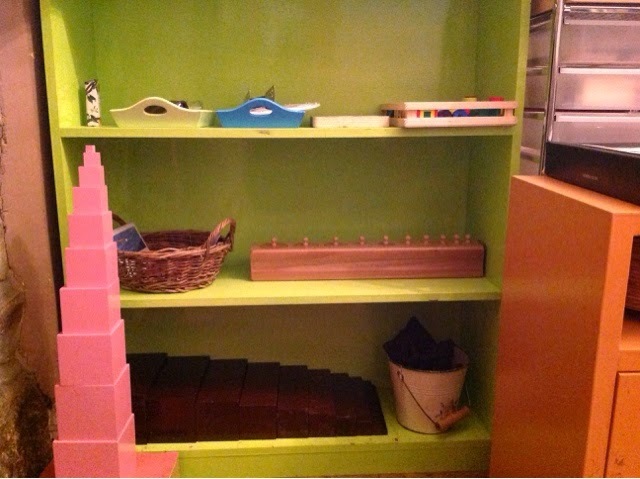 The bottom shelf holds the brown stair and a bucket with matching bean bags. I didn't get a photo of the little bags but they are very simple, all sewn out of the same fabric. There are 8 of them, (4 matching pairs), one pair have dry popping corn inside, another pair have 5 pieces of dry penne (large pasta) in, another pair are stuffed lightly with cotton wool, and the last pair have some nice crinkly (washed!) crisp packet! They are layed out on the rug and matched by feel and sound. 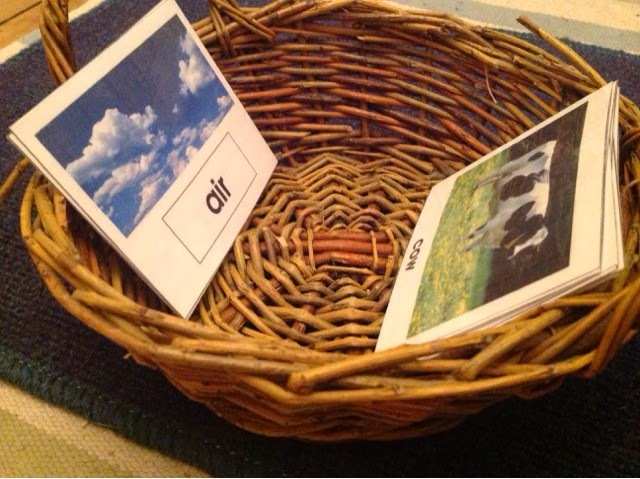 The next shelf up holds these land, air and water cards. I couldn't find a place where the light didn't reflect off these but you can still see what they are. At the moment I don't have any storage to keep the title cards and the other cards separate so I have been trying to teach rogue to collect up the pictures in a random order and put them on one side of the basket and then to collect the title cards separately and put them in the other side. Sometimes happens! Next to those on the middle shelf is cylinder block 1, this is a real favourite and gets taken out at least once a day. On the top shelf, first on the left is a tiny little tin which serves as our colour box one. 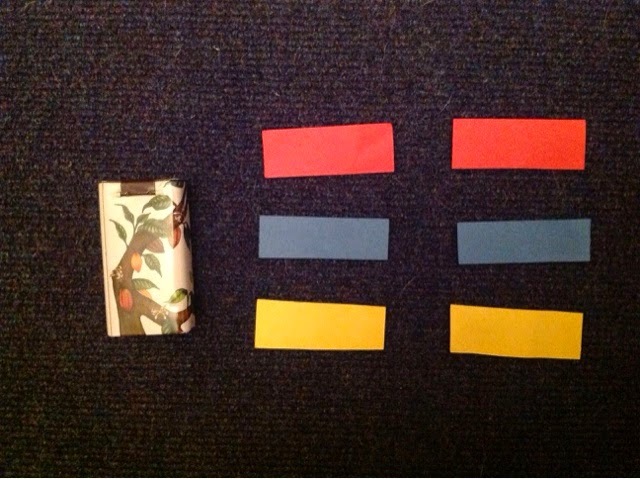 It is super simple, just some rectangles of card in the three colours to match. 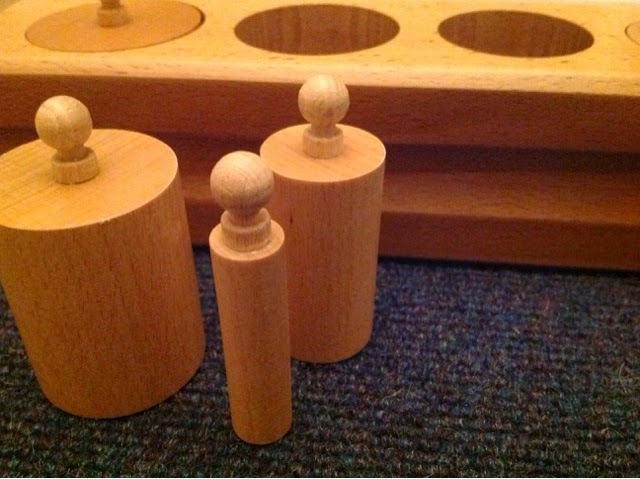 There are two practical life trays on the shelf next. The first is a little coin purse with matchsticks in which are taken out and 'posted' into an old spice jar with little holes in the lid. 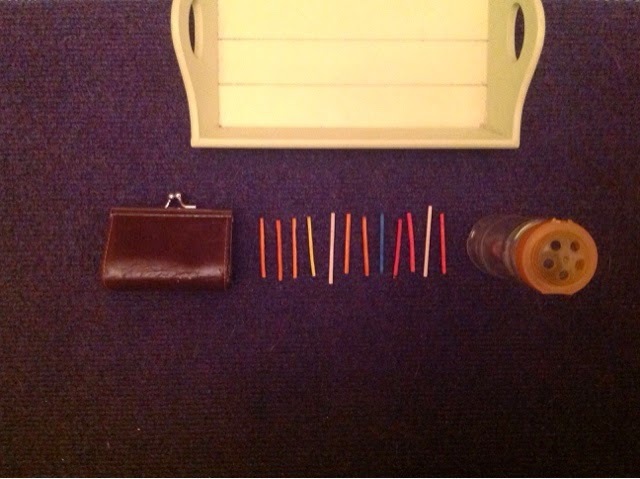 The lid then has to be unscrewed and the matchsticks put back in the purse. 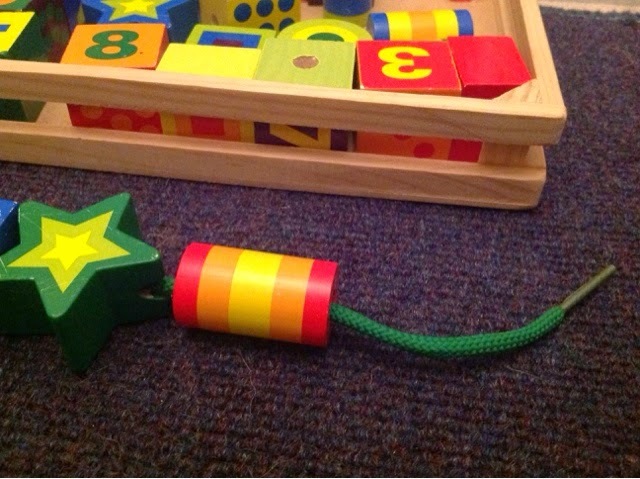 Lots of fine motor skills there. 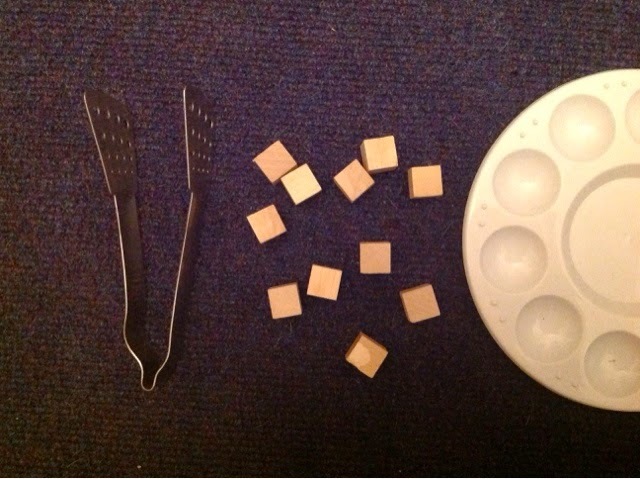 The second is a classic, using tongs to put the wooden cubes into a paint palette. 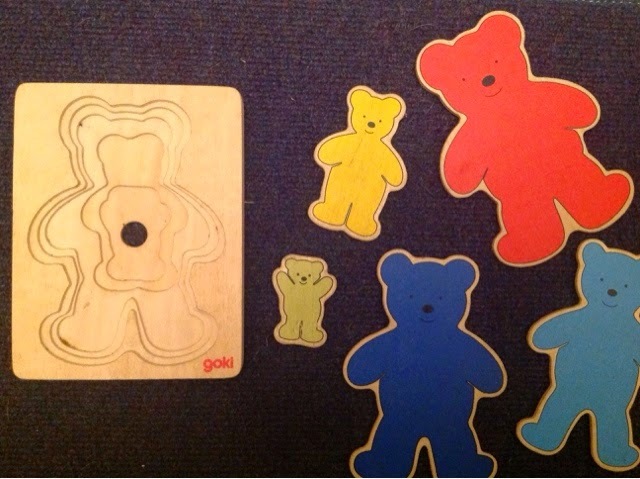 Next is a stacking, bear puzzle which rogue loves, he does the puzzle on its own but also brings them out regularly to climb the pink tower! And last are some big beads for lacing. There are some language things out and a couple of other areas I'd like to show you but this post is long enough so I will do that tomorrow.